Good credit is an important part of your financial health. Your credit score impacts your ability to borrow and the interest rates you'll pay for loans and credit cards. That's significant if you need a loan to start a business, finance a car purchase or buy a home. Building good credit habits early in life can lead to a stronger score and your credit still needs to be nurtured once you reach retirement. While you may not have immediate plans to borrow in retirement, there are some key credit score questions to consider later in life. 1. Will Closing Credit Card Accounts Hurt My Score? Closing credit card accounts in retirement can affect your credit score if you're still carrying a balance when the account is closed. That's because a significant part of your credit score is based on your credit utilization ratio. This is the amount of available credit you're using. Closing accounts while you still have a balance directly affects your utilization ratio, which in turn can negatively affect your credit score. If you're considering closing a credit card in retirement because you no longer plan to use it, be sure to pay the balance off first to minimize any negative effects of shrinking your total credit limit. 2. Does Credit Matter for Tapping Home Equity? Retirement may give you the time you need to finally make those home upgrades or repairs that have been on your to-do list. If you're mortgage-free or you've accumulated a sizable amount of home equity, you may consider borrowing against it through a home equity loan or line of credit to cover the cost. If that's the case, your lender will absolutely consider your credit rating as part of the application and approval process. A good credit score can mean easier approval and a lower rate on what you borrow. But, this is one of those credit score questions that can have multiple answers. If you need to generate an additional income stream in retirement, a reverse mortgage is another way to access your home's equity. The difference is that your income and credit score are less important in this scenario. In fact, there's no minimum credit score required to obtain a reverse mortgage. 3. How Can Cosigned Loans Affect Credit Scores? This is one of the most important credit score questions to ask if you co-signed on a car loan, home loan or student loan for one of your children or grandchildren. Co-signing on a loan, either prior to or in retirement, can have serious implications for your credit score. As the co-signer, you assume shared legal responsibility for the debt, even if you're not the one who's repaying it. If your co-signer defaults on a loan you've signed your name to, debt collectors can pursue both of you to recover what's owed. That includes being subjected to a civil debt collection lawsuit. 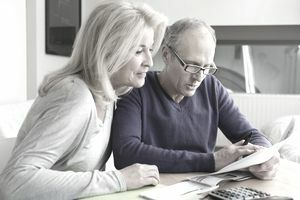 If a judgment is entered against you, you run the further risk of having your individual retirement account or other income garnished, or your bank account frozen, depending on where you live. 4. Will Credit Scores Affect My Insurance Rates? If you're hoping to save money on car or homeowners' insurance in retirement, your credit score matters. With the exception of Hawaii, California, and Massachusetts, every state allows car insurance companies to check your credit prior to approving you for a policy. Your score can also be considered for homeowners' insurance. Insurers use your credit profile to gauge how much of a risk you are and how likely it is that you may file a claim. A strong credit history and a good credit score could help you to secure a lower rate on insurance coverage, while a lower credit score could result in higher premiums or even a denial of coverage. 5. Is Travel a Big Part of My Retirement Plans? Traveling the world is a goal that many retirees share but it can be expensive. Opening a travel rewards credit card that offers miles or points on purchases, as well as other money-saving travel perks, can be a great way to see the sights without draining your nest egg. The hitch, however, is that many top-shelf travel cards that offer premium rewards and benefits require you to have excellent credit to qualify. Your credit score also affects the annual percentage rate you'll pay for a travel rewards card. Paying your balance in full each month is the best way to avoid interest charges but if you're charging a more expensive trip, you may need a little more time to pay it off. That's when your credit score can make a difference in how much the interest charges add to the total. 6. What's the Best Way to Maintain Good Credit in Retirement? When asking credit score questions, it's important to think about the credit habits you've already developed. If you're entering retirement with a good score, then maintaining that score is a matter of following those same practices. If your credit score in retirement isn't as high as you'd like, you can also adopt those same habits to improve your credit rating. Remember also to monitor your credit regularly in retirement. That means tracking your score from month to month, as well as checking your credit report regularly for any potential warning signs of identity fraud. The sooner you spot a credit red flag, the sooner you can act to prevent an identity thief from destroying your score.